This week was a busy week with lots going on about careers. A group of senior cycle students went to UCC on Tuesday to learn all about what the Commerce degree is about. The day was thoroughly organised with an overview by the director, then talks from current and past students plus lecturers outlining the different major specialisms. The students were also given a voucher to have lunch in the main restaurant, giving a further insight into college life there. Wednesday had two guest speakers come to the school. Large numbers of mostly fifth years came to hear all about Apprenticeships but Paul from the Cork Training Centre. 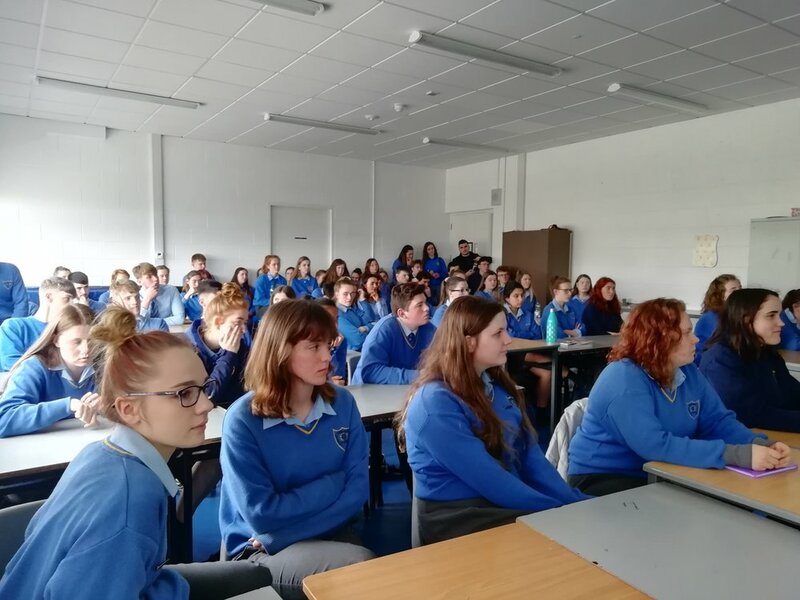 Later we had a talk from Selina from UCC who explained all the different courses the College of Arts, Celtic Studies and Social Science. On Thursday, CIT held an Engineering Exhibition and a group of senior cycle students went up to explore what Engineering is like in CIT. Lots of stands were in the Nexus hall with displays of the final year students in the different Engineering courses.